Today was the first day of ESY here in NY. 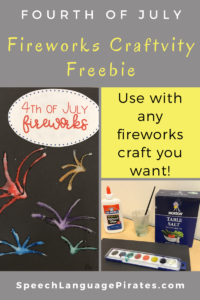 It’s the first time in a while that I’ve worked the day(s) before 4th of July, so I tok advantage and made a corresponding craft for the holiday! 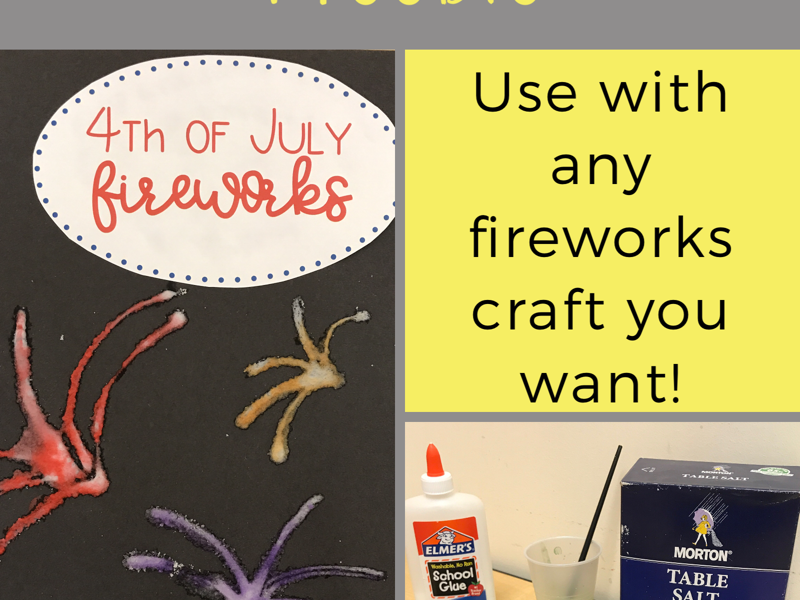 You’ve probably seen many fireworks crafts floating around Pinterest. This year, I chose to do one involving glue, salt, and watercolor paints. Rather than just putting the fireworks on black paper, I wanted to add a title. It helps parents talk about the project at home, adds some flair, and adds another step in a simple project. It allows me to target requesting, concepts, following directions, and elicits lots of language when we talk about the shape, colors, and words we see. First, we glued the heading at the top. I recommend using a glue stick for this step. For a couple of them, I used liquid glue. Oddly, some of the salt began to stick to the glue through the paper. Then I drew some fireworks with liquid glue. 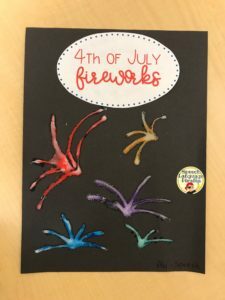 You can use a pencil to draw the fireworks and have your students trace over the lines with glue. Next, cover the glue in salt. Let it sit for a couple minutes to dry. During this time, we talked about when and where we see fireworks; what they sound and look like; who we watch fireworks with; etc. 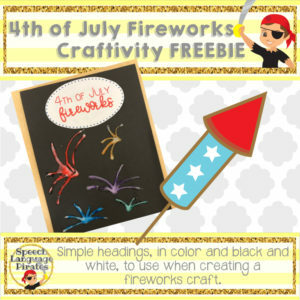 I also found some fun, free apps on the iPad where students can “set off” some fireworks of their own! 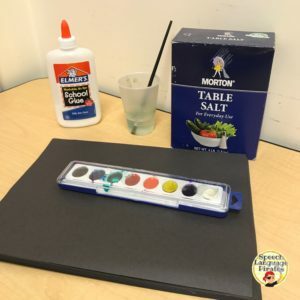 After that, We used a paintbrush to dab watercolors GENTLY onto the salt. The more liquid is in the paint, the better. Ideally the paint would almost just drip off of the paintbrush. It looked so cool as it hit the salt and spread out all over! They came out very cute 🙂 If you’d like to download the free heading, which comes in both color & black ink only, click here! Have a happy and safe Fourth, everyone!